You can come down here this Saturday January 12th 2019 from 9am - 6pm at 11205 149 Street NW to see "Isabelle" in person. You will be able to get in her, check her out, touch her, poke at her and read her carfax report. You can also register early and avoid the line ups for when you come to bid on her this Sunday January 13th 2019. The auction goes live at 10am SHARP!! You can swing by Kastner Auctions at 11205 149 Street NW this Saturday January 12 between 9am - 6pm to see, test, touch "Mirabella"! While you are here you can register early an avoid the line-ups on Sunday January 13 or, If you choose to bid online, you can always ask Lloyd, SP or Alisha on Saturday how to get yourself set up for success! If you have any other questions, please call our office at 780-447-0596 or reach out to us here via chat or email! Yet another seized and taken away, and yet another opportunity for you to get your hands on this "Stallion Trailer" of a holiday trailer! This beauty and auspicious trailer can be publicly viewed this Saturday January 12 between 9am - 6pm, here at our warehouse, 11205 149 Street NW. Saturday is the when you can walk in, sit down in it, check out the rooms, structure and ask any questions you have! While you are here, you can also register early and get all the know-how you need. Or, if you decided to join us online, we can guide you how to register and get yourself prepared for all the action for when we go live on Sunday January 13 2019 at 10am SHARP. Don't forget! We also sell mattresses 7 days a week! Please be sure to see Lloyd when you come on Saturday, he will be sure to get you a great deal on a mattress for this trailer or for your personal home needs! 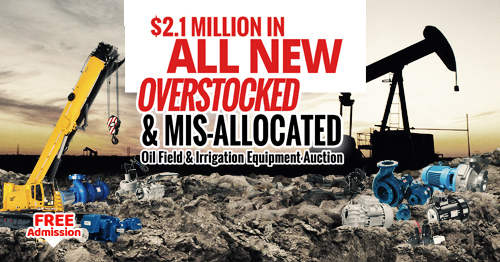 Here is a small sample of what you can expect to find in the Oilfield Auction this Sunday, January 13th @ 10 AM in Ring 3.